Leader of Vietnam Vets Against the War will be honored on December 1 at Scholz Garten. 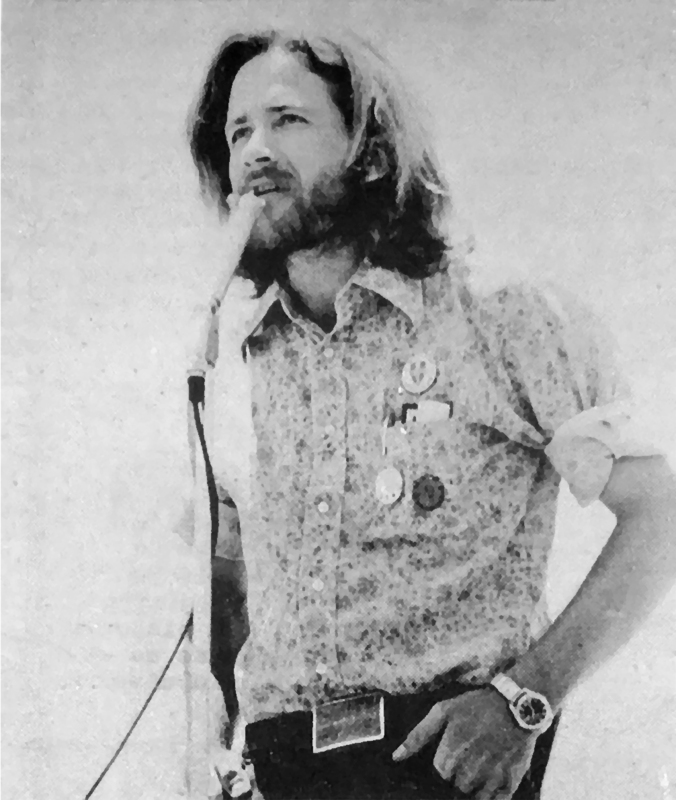 Terry Dubose speaks at anti-war rally at Fort Hood, Texas, in 1971. Photo from The Rag and the book, Celebrating The Rag: Austin’s Iconic Underground Newspaper. AUSTIN — Terry J. Dubose passed away on October 29, 2018, at the age of 74. His life will be honored on Saturday, December 1, 2018, at Scholz Garten, 1607 San Jacinto, Austin, Texas, from 2-4 p.m. In lieu of flowers, a remembrance can be posted to Terry’s Facebook page and gifts made to the Terry J. Dubose Scholarship Fund at the University of Arkansas for Medical Science. Terry was quiet and thoughtful. He grew up in the cotton country of Brownfield, Texas, and graduated from Hardin-Simmons in Abilene. Despite good grades, he couldn’t get a job without a draft deferment in hand. He enlisted in the Army, serving between 1966-1969, and was deployed to Vietnam as a first lieutenant. When he returned, GI bill in hand, he came to Austin to study at the University of Texas. He was questioning the War in Vietnam and he found a vibrant community of support. He left his job near the Capitol to join a spontaneous march after the Kent State killings in 1970. He helped set up a draft counseling center at the Methodist Student Center and then became the statewide coordinator of Vietnam Veterans Against the War (VVAW), speaking to veterans across Texas, spending a lot of time at the Oleo Strut, the GI coffeehouse in Killeen, Texas, near Fort Hood. In the spring of 1971, he traveled with other veterans to Washington, D.C., before the massive May Day demonstration, returning to the demonstration at the LBJ Library dedication, and then making the trip to Killeen when Pete Seeger showed up to entertain GIs. 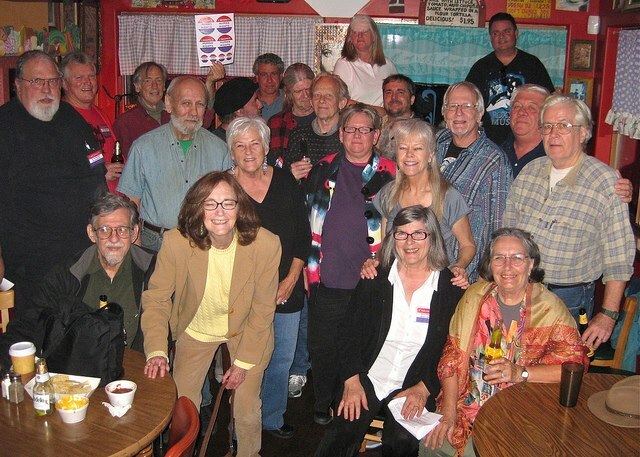 Terry Dubose, far right, joined staff and supporters of The Rag Blog at Maria’s Taco Xpress in Austin, 2012. He went on to be part of the organizing of the UT shuttle bus drivers into Amalgamated Transit Union 1549, then he began studies in health science. He always said he was recouping his Karma. He must have recouped it in spades before his death in October 2018. He was a pioneer in the field of diagnostic sonography, training at Harvard, Yale, Baylor, and the University of California, teaching at Austin’s Seton Hospital and then joining the faculty at the University of Arkansas. When Terry retired, he resettled in Austin to be near family. He made it up to Killeen again in 2012, joining soldiers in a Veterans Day march to advocate for the right to heal. Terry helped plan the 2016 Rag Reunion, participating in a panel on Vietnam; he contributed an essay on the GI resistance to the War in Vietnam to the book, Celebrating The Rag: Austin’s Iconic Underground Newspaper. Terry and Rag photographer and Vietnam vet Alan Pogue were interviewed on Rag Radio October 13, 2017 and Terry was also Thorne Dreyer’s guest on June 17, 2011. People like Terry deserve to be honored and remembered. Thanks to everyone in Austin who knows this. I’m very sad for this loss of your good friend. I know there had to be more veterans of that time than those of us who got to talking to each other about why. I know that now, but I can understand why a lot of people just wanted to keep their heads down and collect the GI Bill. Most of the shouting about Vietnam did not come from vets; we talked to each other first. Terry was one I most admired. He thought it through and concluded: If not us, who? If not now, when? He was happy to retrace his steps if necessary to persuade others but mostly he understood that as veterans we could not be attacked in the same way as the rest of the anti-war movement was being attacked. Terry had it figured out and you could always count on him. He probably knew more anti-war veterans than anybody else in Austin because he always kept his eye on the ball: Bring ’em home. Bring ’em home now. He was all about healing and the mark he made in the medical field surprised none of us who knew him. Terry saved lives, indirectly and directly, and it was a privilege to be his friend. Terry contributed a vital chapter to “Turning the Guns Around” (Waterhouse and Wizard, Praeger Publishers, New York 1972), a book about enlisted men’s and women’s opposition to the Vietnam War and military hogwash. In his,chapter, he bridged the gap between GI dissent and the just-emerging veterans movement that was a crucial factor in swaying public opinion to the antiwar point of view. He was a sweet, gentle, even-tempered person and quite courageous. One of the good guys for sure! I had not been informed of Terry’s death and it is with a great sadness that I learn of this. There is a large hole in the universe now. I came into VVAW when Terry was our leader and spent many evenings at his house. We have lost some great people, John Kniffin, his wife Cathy and now Terry. It is my hope that some will come to replace them in these terrible times. May he walk the spirit road to peace. RIP my brother.